A space conversion is taking a space that may be used, or could be used better, in the home, and converting it into more usable space. Some of the most common additions are converting a garage into a game room or small apartment, but something as simple as turning the space underneath the stairs into a closet or bathroom. 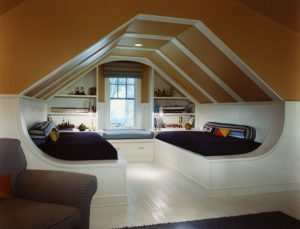 The most common types of space conversions are attic and garage conversions. These spaces are usually adequately large enough to create a sizable bedroom or lounge area such as a game room. Many two-car or three-car garages are large enough to be converted into a small apartment, which can be a perfect space for a college student or rented out. If your home has a basement, this space is also a great option for remodeling, and can be turned into a game room, apartment, or a series of additional bedrooms. Even smaller space conversions such as opening up unused space to add additional square feet to an already existing room can make a huge difference in how the space feels. Opening up areas from underneath stairs, removing closets that may not be used, and taking down unnecessary walls to open up spaces. These types of space conversions can be very helpful in smaller homes. To get an estimate for your space conversion, call 281-789-4308 or contact us online today.